That's all from Holyrood Live on Thursday 28 March 2019. 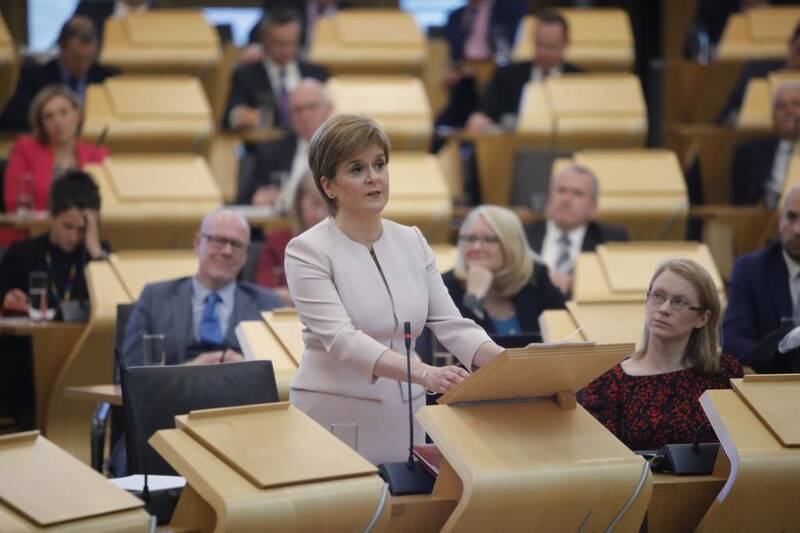 The first minister faced calls to top up child benefits by £5 and bring forward the date for an income supplement. New government figures published today indicated the number of people living in relative poverty is rising. Scottish Labour leader Richard Leonard once again called for the government to back the Give Me Five cmapaign during first minister's questions. And Scottish Green co-leader Alison Johnstone urges the first minister to ensure the planned income supplement was brought in sooner than the current plan of 2022. Ms Sturgeon insisted poverty was on the rise due to UK government austerity and confirmed an assessment of the supplement would be published in June. Fair Work Minister Jamie Hepburn highlights the supported employment model and supported business around the country. He criticises the UK government's welfare reforms, saying they have been damaging to disabled people. But he accepts the point made by Tory MSPs that it would be beneficial to work with the UK government when it makes sense to do so. He agrees that we need to look at solutions to better embed autonomy for disabled people. The pervasive nature of the disability employment gap is unacceptable and is nothing short of an economy injustice, Mr Hepburn argues. The minister confirms the government will be accepting both Conservative and Labour amendments this evening. Tory MSP Michelle Ballantyne says the opportunity to work is vitally important to disabled people. Ms Ballantyne adds that the disability employment gap, at 35%, is clearly one we still need to tackle. She cites a disabled person who told her they just wanted a normal job. The Tory MSP points out there is still only one Changing Place toilet at the Scottish Parliament. She says disabled people in Scotland have faced a plethora of services which is confusing and she calls for them to be brought together. Labour MSP Daniel Johnson says there needs to be a greater acceptance around discussion of disability. He highlights his own ADHD, which he says he had been "reticent" to describe as a disability until equality activist Pam Duncan-Glancy‏ told him to "own it". The term 'reasonable adjustment' is often treated as an oblique black box and we must break down what it means in practice, he says. "What we need is dialogue, we need understanding." Concluding, Mr Johnson criticises the illegal exclusion of pupils with autism from schools because "it starts with education and that cannot be allowed in modern day Scotland". At whatever level you wish to take part, sport and physical activity can be an enjoyable lifestyle choice. In the past, it may have been difficult to find a local sports club that could cater for individual needs, but nowadays nearly all sports have options or variations for disabled people and many clubs can accommodate people regardless of physical limitations. Tory MSP Tom Mason explains he is technically disabled but more than capable of taking part in this debate. There is a lot of good going on in the midst of real challenges, explains Mr Mason. He says he hopes all MSPs will work together to ensure those with disabilities in Scotland enjoy exactly the same opportunities as those without. Ever get the feeling that every hashtag you think up has been used before? Well, it turns out there are still a few that haven't - and Canadian Andrew Gurza recently hit upon one. "I put it on my Twitter one day and I noticed that nobody was using it," he says. "I was like, 'Wow,' so I ran with it and said, 'OK, I can turn this into something really fun.'" Ind MSP Mark McDonald begins by highlighting how disability has impacted his own life because of his disabled son. He says for many the diagnosis of disabilities is still not where is needs to be, such as with conditions like autism. Diagnosis can be empowering, but it can also be incredibly isolating if you don't have ready access to support, Mr McDonald tells the chamber. He praises Grace Warnock's campaign to have better signage on the doors of disabled toilets, backed by Labour MSP Iain Gray. SNP MSP George Adam says until he married his wife Stacey, who has a disability, it was not one of his priorities - but now it is. "God only knows where I'd be without her," he tells the chamber. Disabled people make up 20% of our population Mr Adam says. We need to ensure businesses can be flexible enough to meet the needs of disabled employees, he adds. Nigerian Olajumoke 'Jay' Abdullahi has polio and Kym Oliver has multiple sclerosis, they say they are discriminated against because they are black women with disabilities. Kym told BBC Minute people say to her she's "just come to the country to abuse the system". Alex Cole-Hamilton begins by saying the government motion demands support from the chamber. The Lib Dem MSP stresses the extent of the gulf between rhetoric and reality. He says: "Under-representation in our society of people with disabilities is rife." Only 7% of people with learning disabilities are in employment and indeed this chamber does not reflect the "rich panoply of our society", he adds. The Lib Dem MSP calls for MSPs to work together to tackle the challenges the UN has highlighted in terms of achieving equality for disabled people. Social Security Secretary Shirley-Anne Somerville confirmed that the transfer of all disability claimants from the DWP to Scotland's Social Security Agency would not be completed until 2024. Green MSP Andy Wightman highlights that families including a disabled person are far more likely to be living in poverty. He says social security is meant to allow disabled people to live the same quality of life as non-disabled people and he criticises cuts made by the UK government. Disabled people continue to earn less which compounds the problem, adds Mr Wightman. He goes on to highlight a decrease in the number of disabled people on public boards in recent years, as well as the lack of disabled politicians. Practical support is either lacking or not ideal, with disabled people facing unacceptable barriers to participating in ways many of us take for granted he concludes. Mr Griffin says this year's disability access survey found some of our ancient castles are more accessible than local pubs. Exclusion from a community venue or activity means disabled people are prevented from living their fullest lives, he states. Low income can also restrict their freedom to get out, he adds. The Labour MSP says today in Scotland, a disabled person is twice as likely to be in poverty than a non-disabled person. He urges the government to bring forward a debate after Easter recess on social security for disabled people going forward. Labour MSP Mark Griffin praises the Scottish Parliament for being an exemplar with its provision of a BSL channel. Mr Griffin adds we should be clear that a person is not less able to do something just because of a medical condition and they are not less of a person. The Labour MSP points out it is society that stigmatises people with long term conditions, employers who put in barriers and governments who produce policies for people rather than with them. He offers backing for the government motion but calls for a reaction to criticism from the Scottish Independent Living Coalition.